The Donut Dash is a family-friendly 5K run/walk benefitting the Wisconsin Riders of the Police Unity Tour to assist in reaching our fundraising goals. All proceeds benefit the Wisconsin Riders, the Police Unity Tour, and the National Law Enforcement Officer’s Memorial. 5K runners will be chip timed and receive a time deduction of two (2) minutes per donut eaten taken off of their finish time. Awards will be given based on finish time which includes donut reduced time. Kids can participate in the 5K, but they must be accompanied by an adult and the full registration price must be paid. There will be a FREE Kids Fun Run following the 5K. This is an untimed quarter mile run for kids. Registrants will have the option of purchasing a kids event t-shirt for $10 at the time of registration. Shirts are not guaranteed after April 1st. Online registration closes April 23rd at midnight. Do I have to eat donuts? No, but why wouldn’t you? They’re delicious and you earn a two-minute time reduction for each one you eat. Are shirts guaranteed? Yes and no. If you register prior to 4/1 you’re guaranteed a shirt. After that, they are not guaranteed. How many people can be on a team? Teams must be 4 members. There is a setup fee to create the team and then each additional member can join for free with a password set by the team administrator. What if I have more than 4 people on a team? Divide your runners-up and register more than one team. Team finish times are figured by averaging the 4 runners finish times which includes the donut reduced times. Are there awards for the 5K? Yes. There will be awards for 1st, 2nd, and 3rd in each of the following age groups: 5-8, 9-12, 13-18, 19-29, 30-39, 40-49, 50-59 and 60+ and the team division. There will also awards for the fastest male/female, most donuts eaten male/female, most donuts eaten by a team and fastest Law Enforcement Team. Can my child run the 5K with me? Yes. You must accompany them on the 5K, they must be registered and the full registration price must be paid. Is the Kids Fun Run free? Yes. It’s totally free and it will follow the 5K. There are no shirts for this run unless they are purchased for $10 at the time of registration. Are there price increases? Yes. After the opening day promotion, there will be small price increases on 3/1/19 and 4/1/19. Join the Wisconsin Riders on Saturday, September 8th at Regner Park in West Bend for our 9th annual Pig Roast. The Roast is a family friendly event packed with great food and awesome raffle prizes. The Roast begins at noon and comes to a close at 7:00 p.m..
Advance tickets can be purchased for $10 from your local Wisconsin Rider or by emailing wiridersput@gmail.com. Ticket prices increase to $15 at the door. All proceeds support our mission to "Ride for Those Who Died" ensuring our fallen heroes are never forgotten. 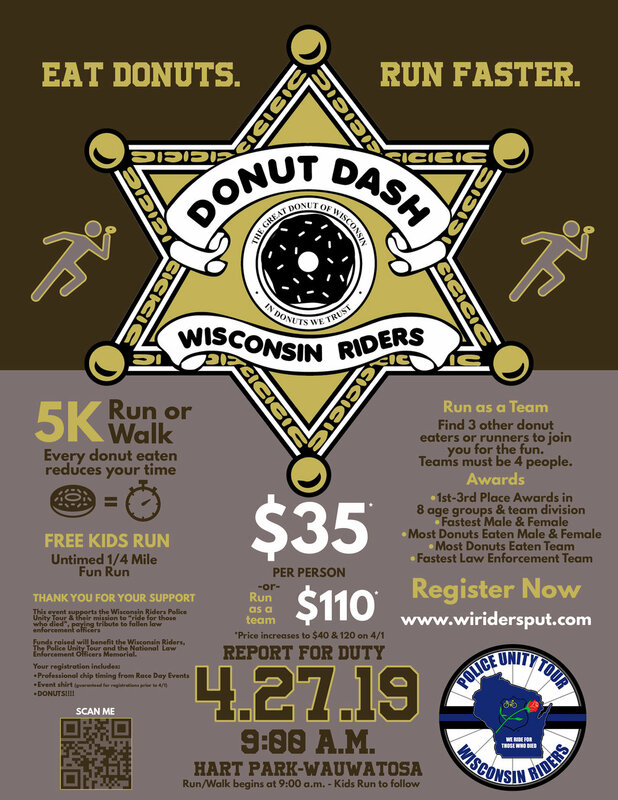 The Donut Dash is a family friendly 5K run/walk benefitting the Wisconsin Riders of the Police Unity Tour to assist in reaching our fundraising goals. All proceeds benefit the Wisconsin Riders, the Police Unity Tour and the National Law Enforcement Officer’s Memorial. 5K runners will be chip timed and receive a time deduction of two (2) minutes per donut eaten taken off of their finish time. Awards will be given based upon finish time which includes donut reduced time. Kids can participate in the 5K, but they must be accompanied by an adult and the full registration price must be paid. There will be a FREE Kids Fun Run following the 5K. This is an untimed quarter mile run for kids. Registrants will have the option of purchasing a kids event t-shirt for $10 at the time of registration. Do I have to eat donuts? No, but why wouldn’t you? They’re delicious and you earn a minute time reduction for each one you eat. Are shirts guaranteed? Yes and no. If you register prior to 4/1 you’re guaranteed a shirt. After that they are not guaranteed. How many people can be on a team? The minimum for a team is 3 runners and the maximum is 4 runners. When registering as a team it’s easiest to have each runner’s individual email address so they receive a confirmation email to complete their registration which includes signing the waiver and selecting their t-shirt size. If only one email address is entered, then that person will either need to complete all the registrations or forward the emails. What if I have more than 4 people for a team? Divide your runners up and register more than one team. Team finish times are figured by averaging the fastest 3 out of the 4 runners finish times which includes the donut reduced times. Are there awards for the 5K? Yes. There will be awards for 1st, 2nd and 3rd in each of the following age groups: 5-8, 9-12, 13-18, 19-29, 30-39, 40-49, 50-59 and 60+ and team division. There will also awards for the fastest male/female, most donuts eaten male/female, most donuts eaten by a team and fastest Law Enforcement Team. Are there price increases? Yes. After the opening day promotion there will be small price increases on 3/1/18 and 4/1/18. Join us, Saturday September 9th, for a free 14 mile bicycle ride to honor our fallen law enforcement heroes. The free group ride will depart Regner Park in West Bend at 11:00 a.m.. A rest stop and memorial ceremony will be held at the Washington County Fallen Law Enforcement Officer Memorial Benches. The ride will return to Regner Park around 12:30 p.m., in time for the 8th Annual Wisconsin Riders Pig Roast. The ride is free and open to the public. Join us for the ride and roast to support our mission to "ride for those who died". Join the Wisconsin Riders for the 3rd Annual Donut Dash. Eat Donuts. Run Faster. Join us, Saturday, April 23rd, in Wauwatosa, for our second annual Donut Dash 5K Run & Walk. This year we've added professional chip-timing and the option to register as a 4 person team. Join us Saturday, September 12th at Regner Park in West Bend for our second annual Bike for Blue. Bike for Blue is a recreational, self-paced bike ride through the scenic rolling hills of Washington County. New in 2015 is a 50 mile course which allows you to choose from the 25 or 50 mile routes. Exact route information will be posted at a later date. Proceeds from the Bike for Blue benefit the Wisconsin Riders of the Police Unity Tour and the National Law Enforcement Officers Memorial. Eat Donuts. Run Faster. No really. Join the Wisconsin Riders for the 1st Annual Donut Dash 5K on April 18th. Join the Wisconsin Riders - Police Unity Tour and Team Madison Police-Law Enforcement United for their first ever joint fundraiser along with the Milwaukee Admirals AND Foreigner. Enjoy a night of hockey followed by classic rock legends Foreigner in concert following the game all while supporting two amazing groups.